Named after its horned shaped harbour this charming town has lots to offer when you visit on Hoorn sightseeing tours, see the beauty which adorns this town. Much of the area that the town encompasses is made up of water and your visit would not be complete without enjoying the boat tours Hoorn provides along its waters in an electric taxi, where you will see all of the highlights of the town such as the old defence tower. Visit the local shops and restaurants walking tours Hoorn offers and let your guide show you where the best buys are to be found when shopping for souvenirs. Enjoy seeing the beautiful countryside on a Steam Train on private Hoorn tours as you travel past attractive villages and spectacular tulip fields. If you wish to travel outside the town, then Horn hiking tours have many routes for all ages that you can enjoy on the many trails that surround the stunning countryside. A visit to Hoorn will leave you with memories forever where the townsfolk will always give you a warm welcome. 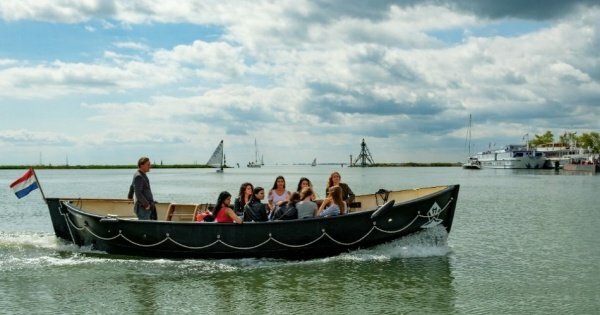 Not only a Watertaxi but also the best way to see Hoorn. The experienced skipper will guide you along al the highlights of this beautiful town with its great history.